Queensland Premier and Arts Minister Annastacia Palaszczuk announced today that Cameron Mackintosh’s acclaimed new production of Boublil & Schönberg’s legendary musical, LES MISÉRABLES, will open at QPAC’s Lyric Theatre in November with tickets going on sale this Thursday 21st May. 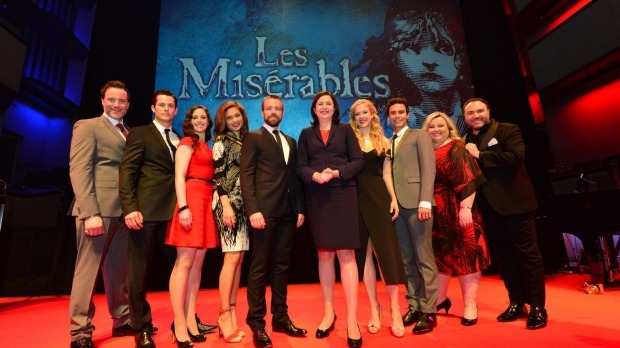 “I welcome LES MISÉRABLES to Queensland and am certain that audiences will not miss their chance to see this much-loved musical in a new production at QPAC,” the Premier said. Having celebrated triumphant seasons in Melbourne, Perth and currently playing in Sydney, Cameron Mackintosh is thrilled to be able to bring this new production to Brisbane. “I’m delighted that the wonderful original cast of my acclaimed new production of LES MISÉRABLES will all be coming to open the Brisbane season in November. Brisbane has always been a tremendously responsive home to my musical productions so I am particularly proud and delighted that this extraordinary Australian cast has agreed to stay together for this season which coincides with the 30th anniversary of the original London production still playing to packed houses at the Queens Theatre in Shaftsbury Avenue. I have always found that the best Australian performers are the best in the world and this Company is one of the finest I have ever had.” Cameron Mackintosh said. One of the world’s greatest musicals, this new production of the much-loved blockbuster features glorious modernised staging, orchestrations and dazzlingly reimagined scenery inspired by the paintings of Victor Hugo. This new version of LES MISÉRABLES is not to be missed. You might think you know the show – but you’ve never seen it like this! Hailed by The Australian as ‘an ensemble of star quality’, the cast has earned heartfelt adoration for their spine tingling and flawless performances. The original Australian production of LES MISÉRABLES saw Cameron Mackintosh launch the careers of some of Australia’s biggest stars, including Marina Prior and Anthony Warlow. For this newest production, he has once again assembled a cast poised to follow the same path. Playing the iconic role of Jean Valjean is established actor and musical theatre star Simon Gleeson. NIDA-trained Hayden Tee plays Valjean’s lifelong antagonist Javert while starring as Fantine is Patrice Tipoki. Playing Madame Thénardier is Lara Mulcahy and joining her in the role of Monsieur Thénardier is Australian theatre and cabaret favourite, Trevor Ashley. Recent WAAPA graduates Kerrie Anne Greenland and Emily Langridge play Eponine and Cosette respectively. Chris Durling takes on the role of the passionate student leader of the revolution, Enjolras and Euan Doidge plays Marius the love struck revolutionary. ⇐ SINGIN’ IN THE RAIN Splashes into Melbourne in May 2016!